Hank Mitchell: [narrating] When I was still just a kid, I remember my father telling me what he thought that it took for a man to be happy. Simple things, really. A wife he loves, a decent job, friends and neighbors who like and respect him. And for a while there, without hardly even realizing it, I had all that. 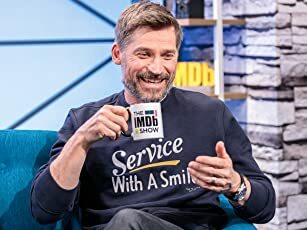 I was a happy man. Sam Raimi may be most at home with Horror, but his body of work in the last three decades has encompassed a variety of genres, the most intellectual of which is drama. One could argue that a Simple Plan is Raimi's smartest picture but it is not a film where we see any of his distinct auteurism. Equal credit for the film's reasonable competence goes to novelist Scott Smith, adapting his own novel for the screen. Three buddies find a plane wreck in the woods, and inside is a sack containing four million dollars. They agree to keep it hidden until they are convinced that the police are not looking for it. Sounds simple enough, but things get ugly pretty quickly. 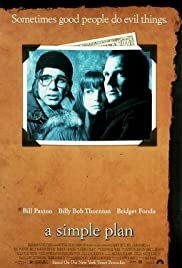 I've never thought much for either Bill Paxton or Brigit Fonda, but A Simple Plan shows them at their best, although Billy Bob Thornton's is the most accomplished performance of the movie. The movie is one worth seeing, it is admirable and thought provoking. There is nothing necessarily unique about it, but then again uniqueness is a rare gift for a movie to have.